The Texas Almanac Teacher's Guide is a collection of lesson plans, designed to accompany the Texas Almanac in the classroom. PDFs of each lesson are FREE to anyone. The Answer Key is not included in the online documents but is available for free by request. Click here to request the latest answer key. You must include your name, email address, school affiliation, and what version of the Almanac you are using. The answer key document will only be provided to official organizational email addresses or home school parents who have sufficiently identified themselves. Answer Keys are also available for previous editions, including: Texas Almanac 2016-2017, Texas Almanac 2014–2015, Texas Almanac 2012–2013, and the Texas Almanac 2010–2011. Lessons based on special features in past issues of the Texas Almanac are available as Special Lessons at the bottom of the list of lessons. Additional lessons will be added as additional content is made available and new editions are published. Appendex tools, such as maps and craft-type activities, are available for use with many of the lessons. 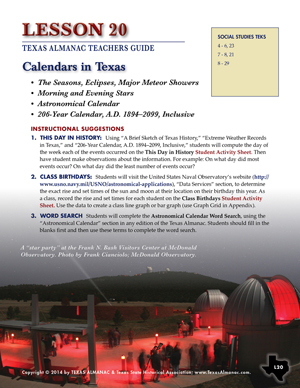 These instructional suggestions and activities were written by current or former classroom teachers and represent a wealth of ideas for making use of the information provided by the Texas Almanac. 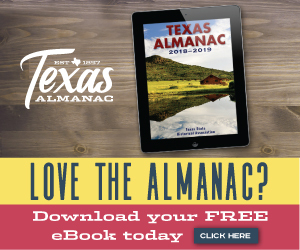 There are a number of exciting projects related to the Texas Almanac that are worthy of noting, including: additional content available on www.TexasAlmanac.com, the availability of the current edition electronically via EBSCO's Texas Reference Center database through your school library, and the online availability of back issues of the Texas Almanac dating to 1857, which can be accessed by clicking "Archive," above. We strongly encourage the purchase of hard copies of the Texas Almanac, as they can be more flexible when technology is unavailable. Furthermore, we realize that hard copy editions are available through a variety of outlets, but encourage you to purchase them through the Texas State Historical Association, as such purchases provide maximum benefit to the organization. These veteran social studies teachers have contributed to the online Teacher's Guide. They have all worked on numerous curriculum projects and conducted a variety of staff development presentations. Stephen Cure is Director of Education at the Texas State Historical Association. Travis Turek from the Denton Independent School District. JoNeita Kelly is Adult Education Program Coordinator at the Texas State Historical Association. Lisa Farmer from the Denton Independent School District. Roseann Ferguson is retired from the Garland Independent School District. Valerie Furnas from the Lewisville Independent School District. Sandra Neal from the Garland Independent School District. Sandra Woodruff is retired from the Garland Independent School District. Sharon Ferguson is retired from the Plano Independent School District. Beverly Haynes from the Dallas Independent School District. Eugenia E. Jameson from John Paul II High School in Plano. Linda Massey from the Dallas Independent School District. Rebecca Moran from the Dallas Independent School District. Ann Wilson is retired from the Dallas Independent School District.